CLASSIC COMEDY. Adapted from the play by J.M. Barrie. Witty, smart, and hilarious, the laughs never end in this side-splitting comedy! Lord Loam arranges tea parties where he forces his servants to mingle as equals much to their embarrassment and to the dismay of his family and friends. However, when Lord Loam and his family are shipwrecked on a deserted island, these class divisions are turned upside down, and they soon discover that there is as little equality on this island than there is in England. 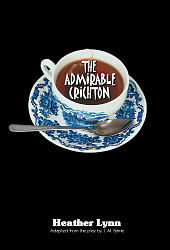 Crichton, the butler, is the only one with any practical knowledge, and it doesn’t take long before he becomes the leader and is referred to as “the Gov.” Lord Loam, on the other hand, assumes the role of a jolly laborer and is called “Daddy.” But when the group is finally rescued, the class divisions are upset once again, and Crichton assumes his position of butler on the other island…England.